Happy 4th of July! If you're tracking our progress, you may have figured out that our plans changed slightly. 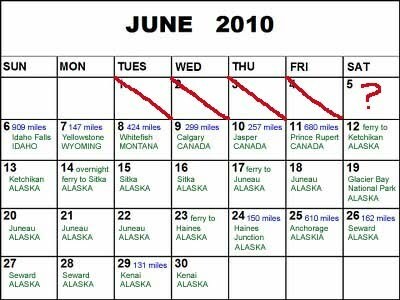 We decided to push to the Arctic Circle and Fairbanks in one day instead of 2 so that we could shorten our driving time each day thereafter. Today was an uneventful 602 miles (13 hours) of driving to Whitehorse. We spotted one coyote and one moose along the way. Time to rest for another long driving day tomorrow - we're going to try to make it to Stewart, British Columbia, Canada. 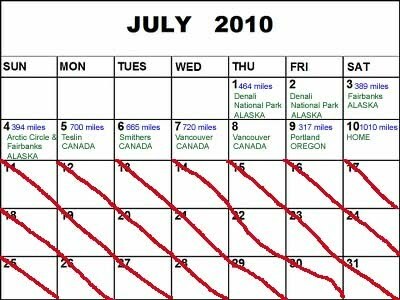 The next day we'll go to Prince George, BC, and then to Vancouver the following day where we're giving ourselves a full day to recuperate. We're cutting out Portland and will instead drive to Medford, OR so that we can avoid driving over 1,000 miles on our last day. I guess we've become more realistic as our trip has progressed! !